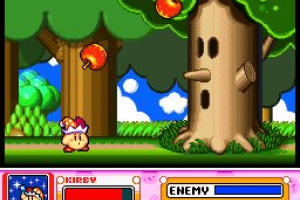 That awful King Dedede is at it again – he's stolen all the food in Dream Land. 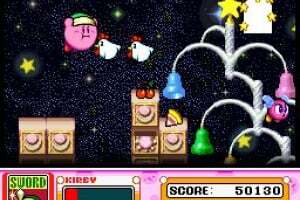 It's up to Kirb to get it back and ultimately save Pop Star from being overtaken. 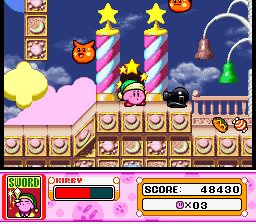 In what may be the most diverse adventure yet for the round, pink hero, Kirby journeys through six main games and two minigames, finishing with the ultimate showdown in The Arena. 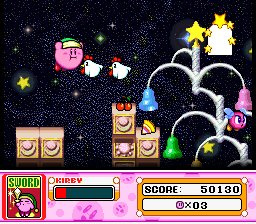 Each game offers its own story and style of platforming action, as well as unique environments and an assortment of enemies. 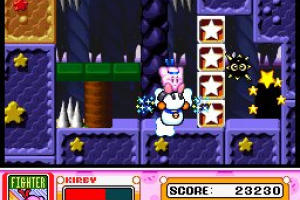 Swallowing an enemy allows Kirby to copy the abilities of that enemy, granting him the power to perform special attacks and giving him a new hat to don. 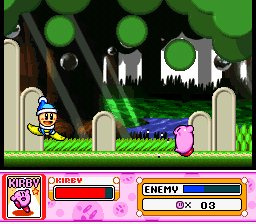 In a strategic twist, Kirby can now give up an acquired ability and use it to turn an enemy into a helper. 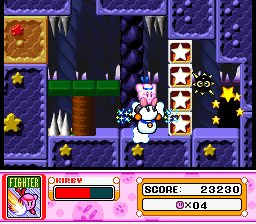 The helper will follow Kirby around and automatically fight as his ally or offer a second player the chance to join in the game by controlling it. 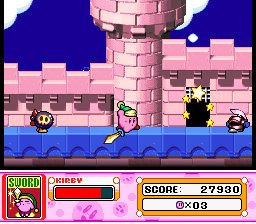 There's never a dull moment as Kirby dashes, flies and swallows enemies in his battle against King Dedede, Dyna Blade and Meta Knight. I wonder how long it takes for this to come out of Japan... Instant download when it comes over here. I don't really want the expensive DS version. I've already finished it years ago. I would've have downloaded this If I haven't played through KSSU, but I guess some people get it both on VC and on DS, so they can play it on TV old-school style and on the road. 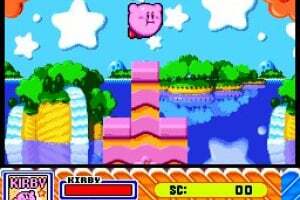 My second favorite Kirby game of all time. I still remember the first time I had played it during Hurricane Rita back in 2005. 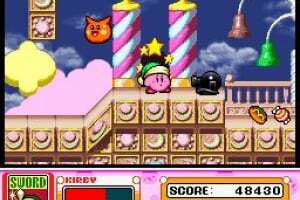 Unfortunately, I was seduced by the highly addicting Kirby's Dream Course, so I played the latter more. But as the years went by, I started to like KSS for the DS more than KDC. Great game, and a total surprise when I heard it was coming to the VC! 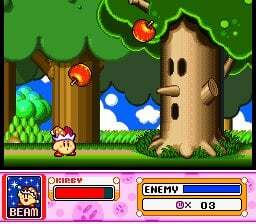 I cannot wait for this game NA Virtual Console release. Too bad. I bought Ultra this year. I have Ultra. I'd dish out Wii points to download the original, too. Just comes to show how much I like the game. This game should come out in America as well! I don't think Ultra's 50 bucks. More like 30 or 35. On second thought maybe I will get this version. I've always prefered playing games on TVs anyway. 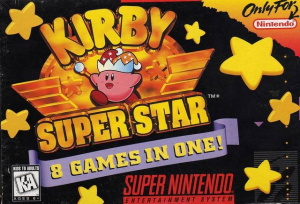 Anybody think the SNES version is better than Ultra? @Kevin: I agree, it's not worth shelling out $35 for a remake when we could wait for it's VC release and pay just $8. I don't buy remakes for a reason. I really want to be a true supporter of the Virtual Console and buying remakes don't count. It would be nice if someone were to put up a video about this game. 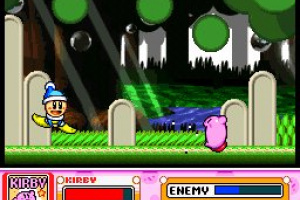 To be honest I only bought Ultra because wasn't this game's rating removed off ESRB with Zombies and the earlier announced games that never got released or am I thinking of another Kirby game? Wonder how long it'll take NOA to release this one. They already owe us some games. I wonder when/if it's coming? @cheetahman91: We'll be waiting until next year. 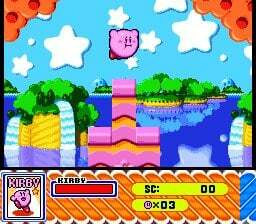 Looks like we have a contender for game #350.
wait, did i say i only have Kirby's dreamland 3 and kirby's adventure? yea, maybe this will be #350, what number are we on atm anyway? I hope it comes to Europe this week. Or at least soon. I guess this means we'll finally be getting Chrono Trigger for VC this year; two years after the DS release. 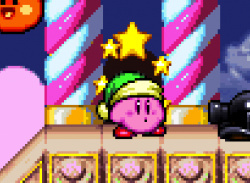 Yay, Kirby! I am so gonna download this when I get home from college! I just got out of final exam, and this news really brightened up my day! Finally, we get a good great awesome game that we can all appreciate. But still, Nintendo, please do us this favor and supply us with games more often!!! too bad I got the DS remake last year,cuz I would so Got this. But the one on the DS is still Fun, I play the Hell out of it. gz NA, now waiting for EU to get it, and then its : download, download done, play ! I loved this game when I used to play when I was 10 years old. This games is great and fun too it makes laugh, scream and use curz words. 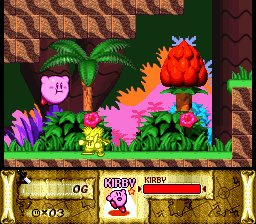 The reasons are when Kirby uses the mike ability 3 times and the enemies crash and this also happens when kirby uses the crash ability. 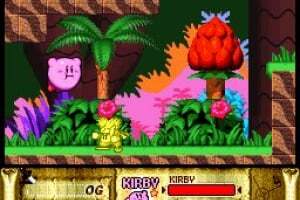 When Kirby gets attack, fall down and Kirby gets up shock I use curze words. 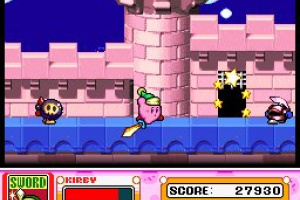 Also when Kirby grabs a foe on the fighter ability, he throws it the enemy is turn up, this is my favorite one. I scream and laugh when he does that I go "A-HA!" I can speedrun Spring Breeze in under five minutes. Of course there is! Paint Kirby! @Dragoon Me, I have the SNES version on Wii's Virtual Console. Can anyone post a list of The Great Cave Offensive treasure chest items from the highest price to the lowest price?